The Nintendo DS Lite, despite being now at least two iterations behind, is getting a price drop. The system priced formally around $129.99 will have the MSRP dropped to $99.99 as of June 5. So just in case you missed getting a DS Lite when it came out in September of 2009 you can now get it for a reduced prince, if you can find it. Now for the more relevant part of this entry. Six Mario games are going to get custom red packaging to make them easier to spot for consumers. 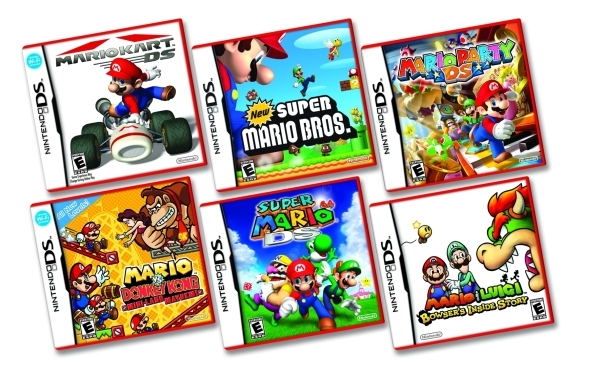 New Super Mario Bros, Mario Kart DS, Super Mario 64 DS, Mario Party DS, Mario and Luigi: Bowsers Inside Story, and Mario vs. Donky Kong: Mini-Land Mayhem will all have special red packaging. The plan on this is to make the games stand out a bit more then they already do, seeing as they say Mario on them and have Mario's picture. But these are supposed to also mark fan favorites based on sales, so it works.